Bill read an article by Bev Morgan about surfing in Hawaii. He dreamed about riding waves for almost 2 years. Then he and his partner George Pittman (left) bought their first boards which arrived by train shortly before Christmas 1961. 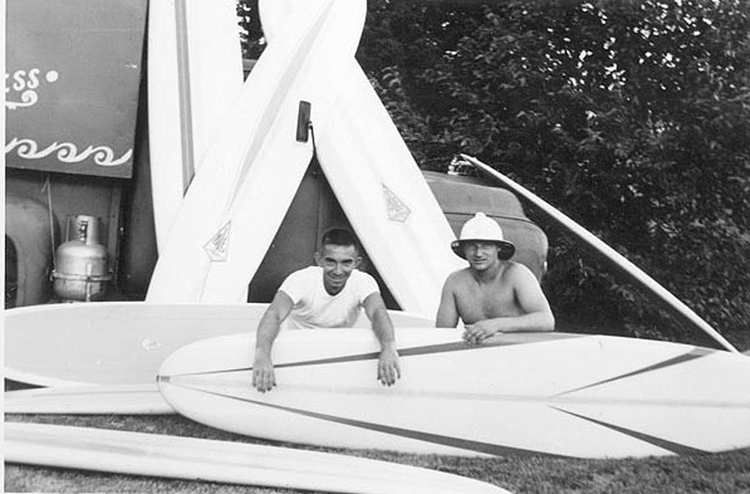 George and Bill with a load of Ole surfboards made by Hobie. Early in 1963. Bill Wise rides at The Tower in 1963.Two years later Bill broke his neck at this same spot, nearly drowned, and was paralyzed for the rest of his life. The picture of Bill at Bethany Beach (drop knee) in 1963 appeared in a magazine article; "Delaware.......... Where's That?" Published in March 1964 Surfer Magazine. "The Surfer Express" from which he sold boards. Bill's business was named "The Eastern Surfer," which you can see on the back of the truck. This photograph was taken in 1962 in his backyard in Harrington, Delaware..
Our 1939 Ford Woody parked in my backyard in Harrington Winter 1963. December 1967 - Bill & Rosalie Wise with Duke Kahanamoku at the contest awards presentation in the Royal Hawaiian Hotel - Waikiki - Honolulu. Bil, "I felt as though I touched the hand of ancient surfers through this man." 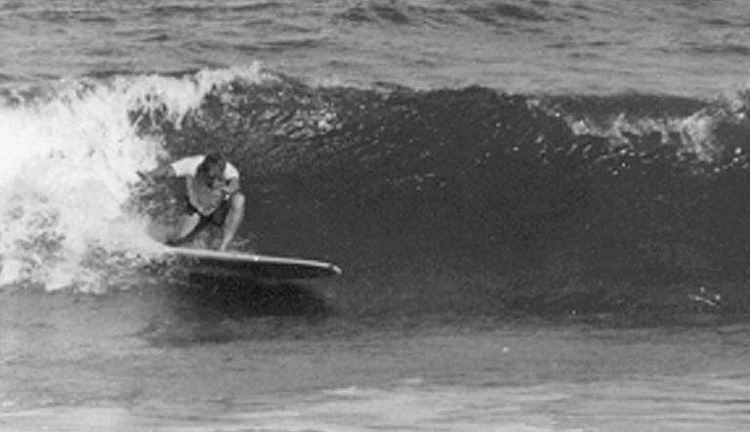 Wise maintained his relationships with the pioneers of surfing and in 1998 was among the first group inducted into the East Coast Surf Legends Hall of Fame. His passion for adventure continued throughout his life as he traveled extensively, sailed, flew gliders, swam with dolphins, and captured the beauty of nature with his camera. His love of surfing, as evidenced by his prized Phil Edwards balsa board that hung over his bed, never faltered. Wise is survived by his wife Rosalie, their four children and nine grandchildren.